Aurifil 2-ply 40 Weight Thread is Aurifil's most popular weight for machine embroidery. It is also suitable for Cross Stitch, Hand Piecing, Lace, Machine Applique, Machine Piecing, Machine and Longarm Quilting. 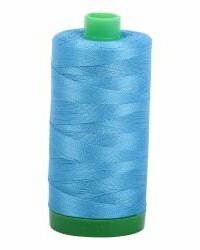 Quilters use 2-ply Aurifil 40wt Mako Cotton Thread when they want their stitches to stand out a little more than they do with 50 weight Aurifil.